This article in The New York Times shows how politicians' clothes come in the limelight when they are in the news for some reason. 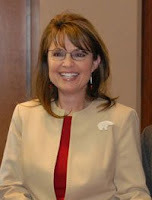 Here, Sarah Palin is being criticized for spending $150,000 on clothes for campaigning, with the party's money of course. Frankly, I don't know what the fuss is about, because 1) she looks exactly the same as earlier, just with a more polished look 2) she needed clothes for her campaign tour! I mean, what's so hard to believe about that? Anybody who understands an iota about women knows that whenever there is some occasion, any occasion - they need to buy clothes. And this is the US presidential elections! I don't blame her one bit, as long as she doesn't colour her hair red (then, it would be obvious that she's trying to look 'trendy'). Closer home, I recall watching news reports of a TV channel on how Shivraj Patil is always impeccably dressed in white. This was during the recent bomb blasts in Delhi, and they made it look like he was guilty because he was so well dressed! They even interviewed his tailor...now, what did they expect? That he should have gone around in rags to offer his condolences? 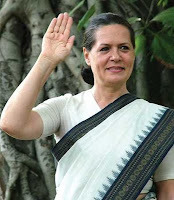 Look at the image change that Sonia Gandhi went through. From her floral dresses to the (mostly) white cotton saris she exclusively wears. I guess this makeover was all the more important for her as she was not born Indian and needed to prove herself. One thing I have noticed about politicians in India is that they wear their patriotism on their sleeves. is it written in their constitution that they should only wear khadis and Nehru caps? One of the exceptions to this is Priyanka Gandhi. She is as comfortable in jeans as salwar-kameez. In short, the modern Indian woman. Wish I could say the same of her brother Rahul who always walks around in crumpled white kurtas...and Sheila Dixit too, who needs to look in the mirror...wonder what she achieves with the disheveled look? Given the shabby state of Indian politics, it's no surprise that our politicians dress the part. But it would be nice to see well-dressed netas as well. APJ Abdul Kalam is famous for his safari suits and Vasundhara Raje has a good collection of saris too. But looking at the global stage, few can beat Bill Clinton's style and charisma.